We are in the middle of completely renovating our garden and we are living in the middle of a dirt patch. While my dog does place a compost bath up at the top of her favorite things, I am not much of a fan. I’m over the whole process at this point and just want to be done. I would love to have a nice barbecue and be able to sit outside under a shady tree but we are still a ways off before we can do that. I know it will all be worth it in the end but our summers are short and dry weather is something that should be enjoyed whenever possible and I feel like all the good weather will be done and we’ll have missed it all. To make up for it, I have been enjoying one of summers best pleasures, watermelon. 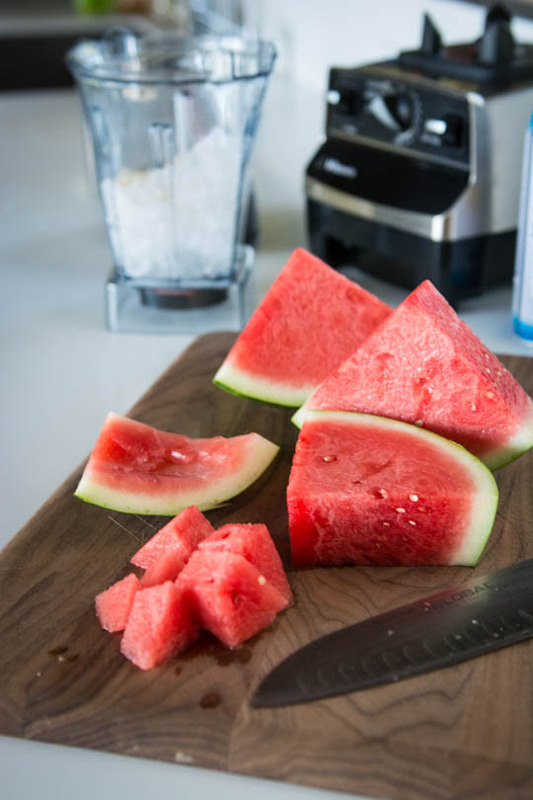 I can’t get enough of it when it’s in season and I have been known to forgo dinner for a big bowl of watermelon chunks. With all the heat we’ve been experiencing here in the Pacific Northwest something frozen really seemed in order. This recipe couldn’t be simpler. 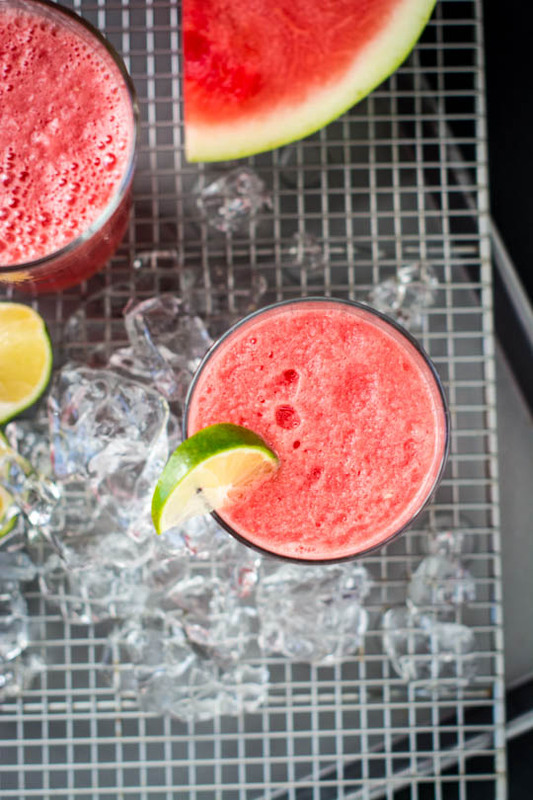 Cubes of watermelon are combined in a blender with coconut water, a squeeze of lime and ice and blended into a slushy, cold, super refreshing treat that is the perfect antidote to a scorching hot day. 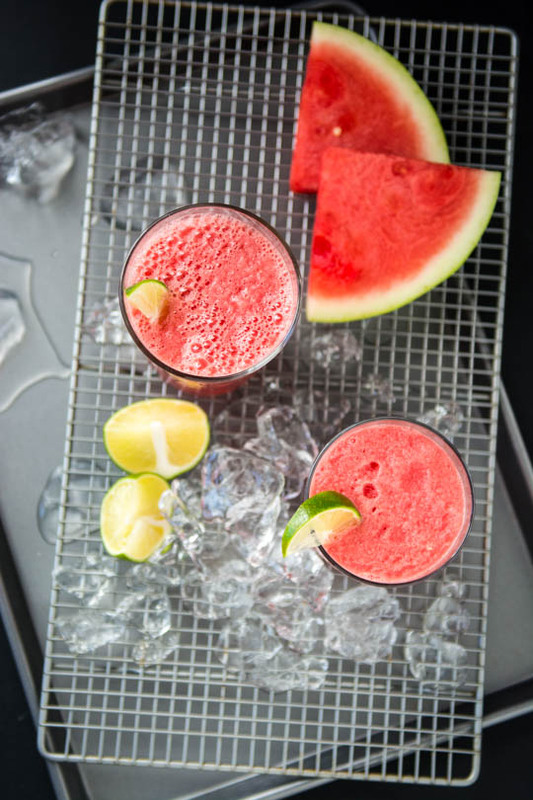 To intensify the watermelon flavor even more, freeze the watermelon chunks overnight and skip the ice. It takes a bit more planning but will result in more of an Slurpie like texture. 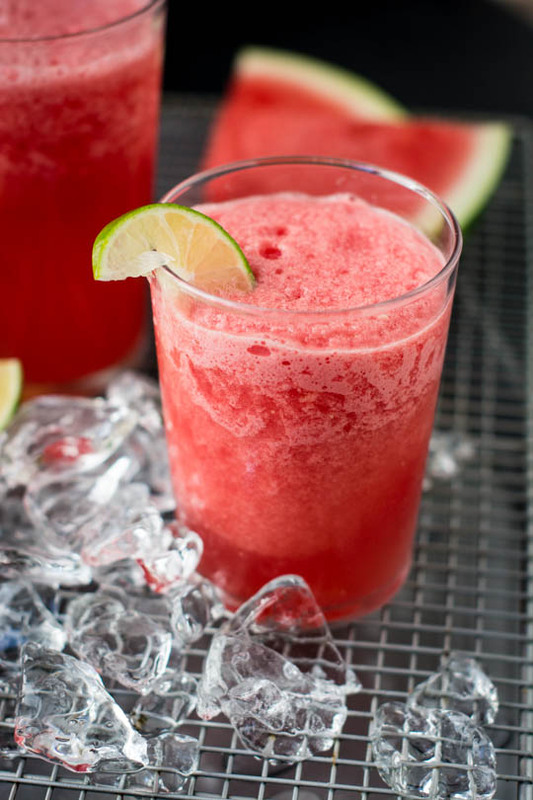 Beat the heat with this super simple frosty treat. 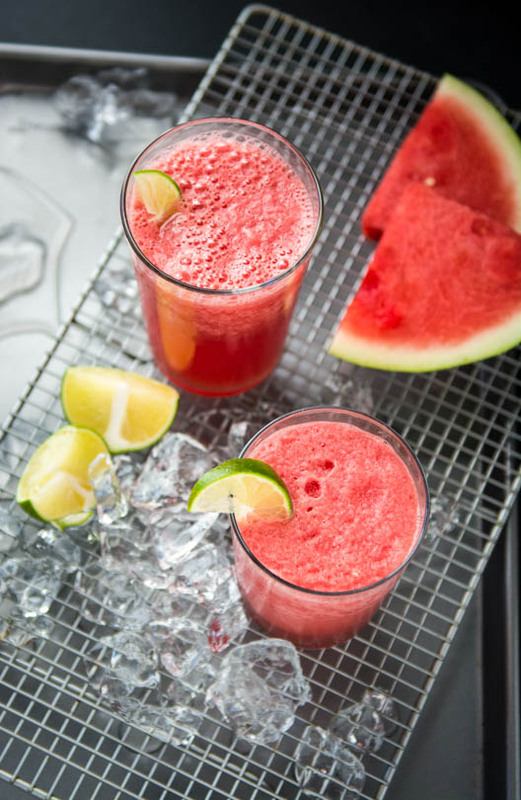 For a more intense watermelon flavor freeze the watermelon overnight and skip the ice! optional: 1 tablespoon sugar, agave, honey or maple syrup. If using honey thin a bit with a tablespoon of hot water before adding to the blender. 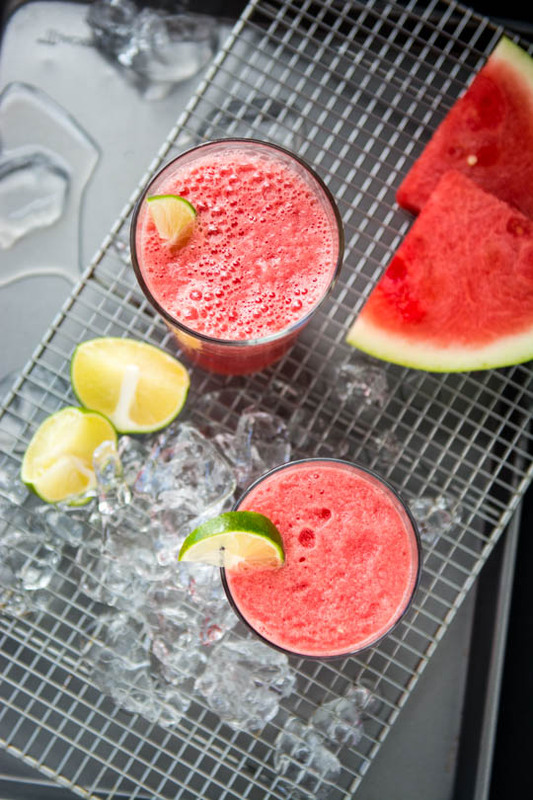 Place all the ingredients in a blender and blend until smooth. If your watermelon isn't very sweet add the optional sweetener if needed. It has been so hot here that this is all I want to eat! We are expecting a break in the weather finally so I may want to get back into the kitchen soon!